Me Oh My! I had this ARC sitting on my bookshelf since before Christmas and I fought a constant daily battle to not grab it and devour it in one sitting. My goal was to wait closer to the release date, but I tell ya, that was no easy feat! 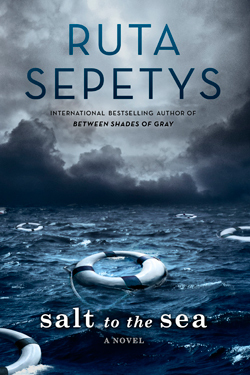 This is Sepetys' third novel, and I am not surprised that it was another outstanding success! Ruta Sepetys has such a wonderful talent of creating characters that you will forever be in love with. You will cry for them, hurt with them, laugh with them and miss them immediately after you turn the final page and say goodbye. Salt to the Sea was delivered in the most perfect way, in multiple perspectives. This group of characters whom were experiencing the same horrors that came during Hitler and Stalin's WWII, were told by four very different point of views. It was haunting, beautiful, ugly and terrifying. I have always had a love for History; And a more special place in my heart for the WWII era. There is something about this era that I am drawn to. I consider myself to be quite knowledgeable when it comes to this time, however, I had no idea about the Wilhelm Gustolff. Salt to the Sea humbled me. It will definitely make you look around and be so very thankful for everything you have in your life! Sepetys has this amazing ability to take the horrendous ugliness of war and weave around it a beautiful love story. She created a family within this small group of characters that no war could tear apart. The relationship between Opi and Klaus, the wondering boy, was truly an honour to read. Their relationship was so tender and loving. Emila was such a sweet and endearing character. The unimaginable things that she suffered through would have broken the strongest of men, and yet, this young girl was still standing tall and mighty. And, of course, the relationship between Joana and Florian. Who knew that during a heart-wrenching story of War you could find light and relief inside of an innocent love story. It is no surprise that I was completely blown away by Salt and the Sea. Sepetys had me at Hello when she debuted with Between Shades of Gray. I can now add this book snugly next to her previous books in my all-time favourites list. I expect to see her work among the most famed literary writers years from now. She has earned a spot on those shelves! Yes, Salt and the Sea will make you cry, it will make you shudder and wince. But, it will also make you laugh, make your heart grow fonder and educate you. It will bring to life a story that needed to be told. I miss this book already! Ive lately began a web site http://www.qualtrics.com/blog/5-must-dos-for-courting-the-millennial-customer/ the details you are offering here has solved the problem extremely. Thank you for all of your time & work. This is the fan club of the Ariana Granada, which provides you the comfort zone in which you can play with the community in the better pace. You have to write my essay for me reviews according to which different people will join this community and make a good platform.